Main power & Cyclic Use. Comments The LC-XC1221P from Panasonic is a world leading ultra high capacity long life battery suitable for continuous cyclic usage such as golf buggies & mobility aids/motorised scooters. Termination is via M5 bolt & nut terminals (bolt & nut supplied with battery). 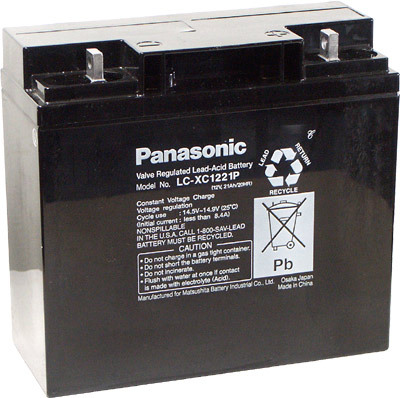 The battery has the same dimensions as the LC-RD1217P, LC-X1220P & most other 17-18Ah SLA batteries so offers significantly greater capacity in the same package size whilst being a dedicated cyclic battery. This VRLA battery is an AGM type. Please ensure the correct charger is used to charge the batteries. To extend overall service life of the battery we recommend the four stage microprocessor controlled Battery Fighter range of chargers. For dedicated cyclic use of the battery we recommend chargers models BFP012 for 12 volt systems & the BFP024 for 24 volt systems (use of two batteries in series). This battery is not recommended for standby applications. For standby use please use models LC-RD1217P or LC-X1220P. Road Freight Delivery. A signature is required upon delivery for these batteries. Please ensure there will be someone to sign for your order at your given delivery address during normal business hours.